Time for the city slickers to LOOK UP and BEYOND our planet! 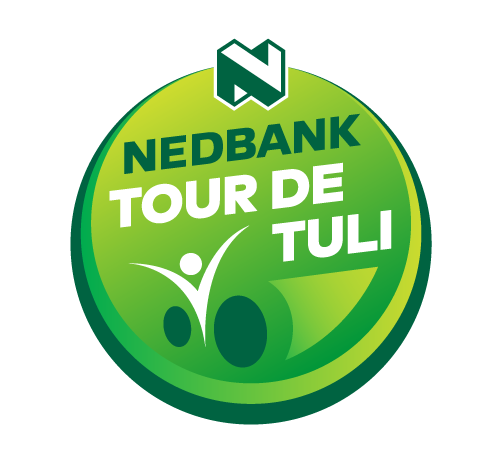 During the 2018 Nedbank Tour de Tuli, I have a challenge for you: take just a few minutes after sunset when it’s properly dark, walk away from the nearest light to a space under a clear, open sky. Close your eyes for two minutes. Tilt your head up, then open your eyes — and keep looking UP. Allow your mind to try and make sense of it all. Everything you see up there is in our own galaxy, one of many billions, and the light you see is from a time long past. You’ve just created your own free time machine. What makes the Tour de Tuli special for the stars? When you get away from the city (and the moon is not out), the pollution of humanity is lessened, speciﬁcally the light! Our cities are hiding more and more of the night sky every year, as the light reﬂected from our street lights bounces oﬀ the surface of the earth and up into the atmosphere. We’re ruining the night, and the only way to see what’s really up there is travel far from the city. How about taking an epic bike adventure during the day and seeing some of the best night sky views in the world? Sounds pretty cool to me. The show never ends and Nature’s TV really does have the best channels. Above: The Milky Way arch. Arching overhead after sunset is the Milky Way in all its glory. This is the time of year when the core of our own galaxy is visible and overhead for most of the night, and when you get away from the city light, it’s jaw-droppingly beautiful. Behind all that dust and dense ﬁeld of stars is a super-massive black hole! This year is special. While we are riding on the Tour, it will be at a really interesting time of year, speciﬁcally 2018. Just after sunset, you will be able to see FIVE planets with your naked eyes, all at once, and four of them will be some of the brightest “stars” in the sky! 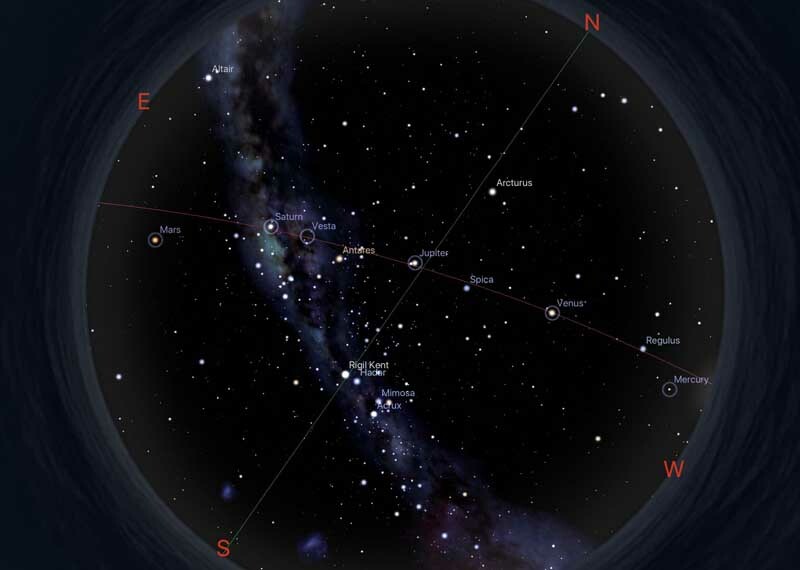 Above: Screenshot of the night sky just after sunset on August 2, 2018. A small, dim star in the west, just skimming the horizon, is Mercury. Just above it, beaming brightly, is Venus. Directly overhead is Jupiter. Dropping toward the east, showing a yellow colour, is the beautifully-ringed Saturn. Last but not least, is Mars, bright and red on the eastern horizon, bigger and brighter and closer to Earth than it’s been since 2003. You’ll walk away from my short talk at the Tour with a better understanding of your place in the universe, what you’re made of, and what’s actually out there! Reality is better than anything our little brains can make up, and just attempting to understand it is what makes us better humans. 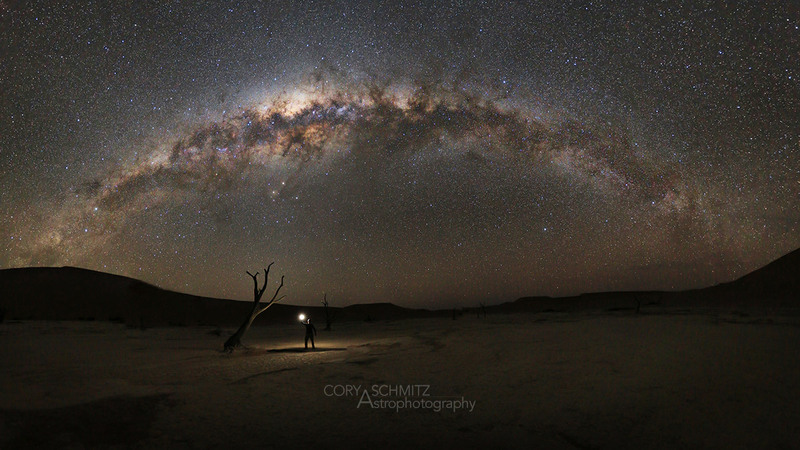 Cory Schmitz is an amateur astronomer and published astrophotographer (and mountain biker! ), originally from the USA. 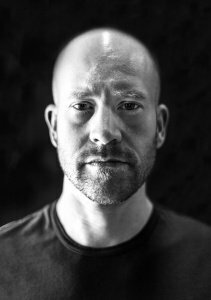 Co-founder of PhotographingSpace.com, where he teaches the world how to photograph the wonders of the night sky, he believes this should be shared and communicated to help us to have a better understanding of and appreciation for the universe.